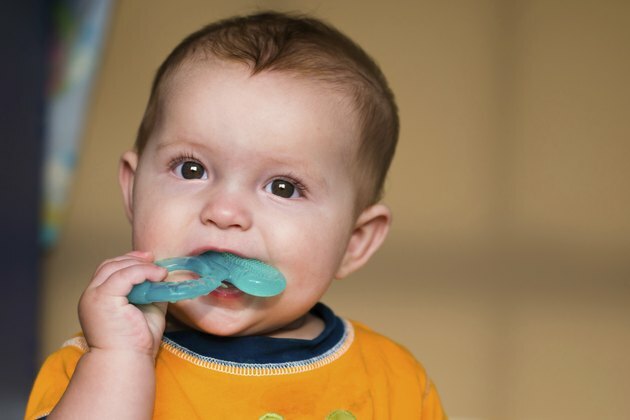 The process of teething involves baby teeth breaking through a child's gums. This can cause red cheeks, fever, swelling, drooling, irritability, sleeplessness and a decrease in appetite. The best way to help your child is to treat his symptoms while teething. Red, or flushed cheeks, specifically around the area that the tooth is emerging, is just one of the many signs of a toddler teething, according to Baby Care Advice. Along with red cheeks, your toddler may seem irritable or clingy and pull at her ears. Red cheeks might be a result of a rash caused by teething, according to AskDrSears.com. One major symptom of teething is an increase in your baby's production of saliva. This results in some serious drooling, exposing the facial skin to saliva. This might look like a raised and red rash on the cheeks or chin. Try keeping the area dry, wash it to minimize exposure to saliva and apply a gentle lanolin ointment. A low-grade fever often accompanies an emerging tooth. A fever can cause red cheeks and flushing of the face. If a fever is the cause of teething, it should not exceed 101 degrees Fahrenheit, according to AskDrSears.com. If the fever becomes higher or lasts more than three days, contact your doctor. You can't eliminate the pain and irritation of teething, but you can minimize it. Offer your child a cold, damp washcloth to chew on to reduce swelling and redness. Rubbing ice or giving your child something frozen can also help reduce pain and redness. Speak with your doctor about the use of pain relieving medication or a topical pain relieving ointment that can also help with redness, advises AskDrSears.com.